Movie Review: With her directorial sophomore, British filmmaker Clio Barnard doesn’t disappoint, and even demarcates a style that despite very own in many aspects, doesn’t hide influences of Ken Loach’s social realism, considering the subject-matter, naturalism and rawness presented. The absorbing “The Selfish Giant” that nothing has to do with gentleness or warmness, follows the 2009 experimental documentary “The Arbor”, about playwright Andrea Dunbar, where the same unrefined approach has been taken with highly satisfying results. The script, written by Barnard and inspired in a short tale by Oscar Wilde, follows two problematic young friends, the impetuous 13 year-old Arbor and his best friend, Swifty, who have a passion for horses. Expelled from school, they both beat the streets of their rough neighborhood searching for some opportunity to earn some bucks. That’s when they enter the illegal and risky business of stealing copper, encouraged by a greedy, unjust scrap dealer who will put them against each other and exploit them without any consideration for their lives. 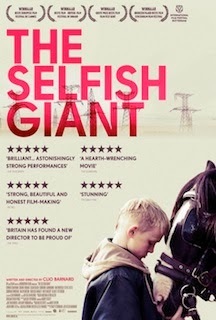 Self-conscious and eye-opener regarding educational problems, “The Selfish Giant” exposes juvenile delinquency in a very compelling manner, thanks to the unimpeachable performances of the young actors, but also aims greediness and exploitation, which, as usual, led to lamentable outcomes. Everything was presented under grey skies, hazy landscapes, and a cheerless atmosphere that will also make the viewers remember its strong images.